I made this free resizer because I needed a free app that would easily resize images in bulk (all at once). I looked around for an app like this and found some good ones but once the trial was over, you had to pay to use them. This one is 100% free and it is now here so you can use it as well. 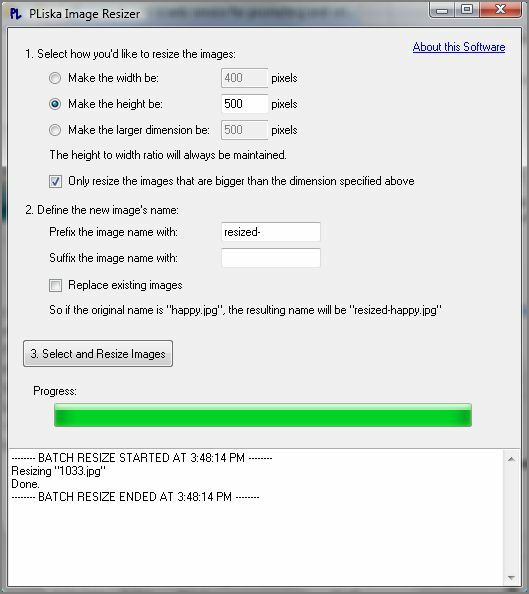 If you’ve used the resizer for a while, or if it’s your first time, you really want to try dragging-and-dropping your images into the Resizer’s window (see Figure 1 below) and using the “Send To” menu (Figure 2) to send the images you wish to resize with the resizer. There is a known problem with the “Send To” feature, look further down the page for more information. Read the changelog to find out what’s new the latest version. This application needs the .NET Framework 2.0 to run. If you’re using Windows, it’s you already have it on your computer. If you don’t, my installer will automatically get it off the Microsoft website. If you’re not using Windows, it will be hard to get my app working. Mostly because it’s hard to get the .NET Framework 2.0 working on another OS that’s not Windows. I have personally never tried to do this. for all of those files must be less than 2048 characters. are sent to the Resizer’s executable. In this link, Dino Esposito (who by the way ROCKS! 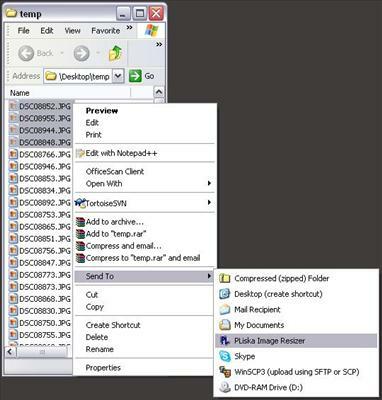 ), explains how to add a context menu to Windows Explorer. This is a feasible workaround for my problem. I say workaround because what I would really want is to use the SendTo menu like the “Compressed (zipped) folder” menu item does it. Hi Carlo, thanks for the offer. But I actually stopped development on this app a long time ago. I just have it available on my website for people that would benefit from it as-is. Your application is great, it helps me so much. I used to spent hours changing the size of many pictures, now I do it very fast! THANK YOU! Just like to thank you. So great app. 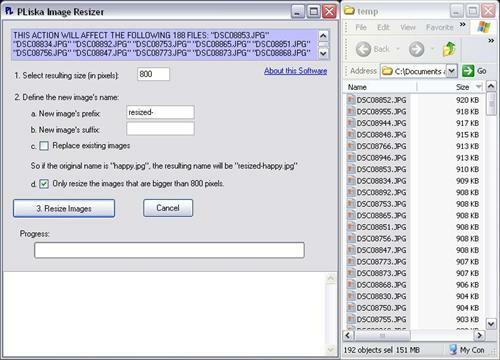 Very useful for multiple image resizing. Thanks a lot. este programa se puede usar para mac? No =(, solo funciona en Windows. In mac you have “Automator” it’s better! just wanted to stop in and say thank you for sharing, this has proved to be very helpful in my business. God speed my friend. Excellent, great software, totally free, 100% recommended! Just to let you know I still love this app! Thanx. This is awesome! I still use it as well. I think one day something like this will be included in the Windows OS, but until then, my app will continue to be used. You would think so. I use it mostly for my blog and social media. I don’t mind large images from my camera for personal use, but I hate being a bandwith hog. Cheers. Though you have stopped work on this app, it is still very useful. I just wanted to pass on my word of Thanks for your efforts. Should you ever feel like doing some more work on it, I’d love to have the opportunity to suggest changes (as I’m sure your other loyal followers would as well). Hey Pedro – I’ve been using the PLISKA resizer since the good ole days at Northface/Neumont. Just used it today because I had a whole bunch of pictures that needed resized. Worked great in Windows 8.1! Yeah, it still works! Not sure how since I haven’t touched the code in at least 5 years, hahaha. I’m glad it helped you and it was nice to hear from you again. I hope you’re doing awesome! This is the best software on the Internet. I’m serious. Thanks Dave! I’m glad it’s still being used and loved.